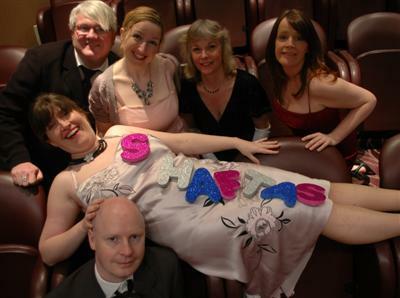 Join Jonathan Woss and Davina McCool at the prestigious SHAFTA awards ceremony 2010, as the Who's Who of D list celebrities struggle with their pride, nerves and valium. Find out who wins the nice n' shiny trophies symbolising public acceptance and outstanding achievement. Who is worthy of a SHAFTA? Review comments from previous shows include "snappy direction", "masterful sound-score", "a cultural collage with charming observation" and "local people laughing at their local lives". The show is 1 hour 20 minutes, plus a 15 minute interval. The show had a successful run in London's West End (August 18th to 21st), and then a single performance in Reading on Friday 8th October 2010, which raised £300 for Hospital Radio Reading. Performed at Lovibonds Brewery, Henley, from Wednesday 22nd to Saturday 25th July 2009 as part of the Henley Fringe Festival. Performed at South Street Arts Centre, Reading, on 18th October 2008 as part of the Reading Comedy Festival.